Sync Performance, a Vail-based apparel brand, is in stitches over its latest Kickstarter success. The 5-year-old startup has sold $50,000 worth of an updated version of its stretchy down ski jackets — about 300 in all — through a crowdfunding website. With two weeks left to go, the campaign has far exceeded its original $15,000 goal. Sync’s new jackets aim to improve on those the company released in 2015. The company’s employees weren’t satisfied with the stitching in the original line; poking thousands of holes in the high-performance fabric, they said, caused tears and rips, as well as limiting the fabric’s stretchability. For the new line, instead of threaded stitching, Sync uses a heated welding process that forms the jacket’s tubes. The result allows wearers to stretch in the jacket even further, without worrying about ripping the seams. The jacket will retail for at least $399, although Kickstarter backers are getting them for less. Sync is manufacturing the jackets in China. Sync also added a showroom to its office and warehouse space at 3971 Bighorn Road in East Vail in October. Sync has four full-time employees, some being former ski racers. 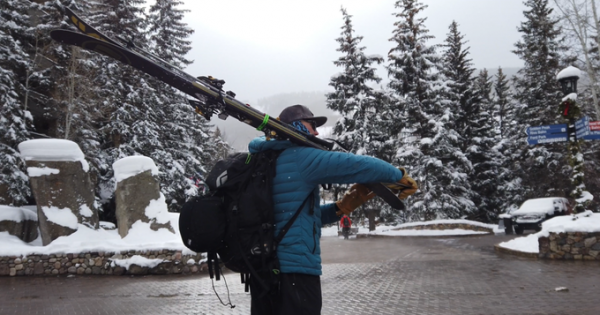 The company also makes ski gear bags, and sells racing suits and other apparel for competitive ski racers at all levels, including DU’s ski team and Ski Club Vail. Its newest product is meant for any outside active pursuit, not just skiing.